Helen Hendee, who founded the alumni relations, annual giving, and major gifts programs at Augusta State University, has received a special recognition from the Summerville Alumni Societies. The societies, which represent Georgia Regents University alums from the College of Education, Hull College of Business, Pamplin College of Arts, Humanities, and Social Sciences, and the College of Science and Mathematics, presented a $20,000 donation to the Helen Hendee Endowment fund at their board meeting on Sept. 4. In her time at the university, Hendee grew alumni events and participation, including the annual Alumni Barbecue, which raises money for student scholarships. Additionally, the A Day Campaign, which supported the university’s annual fund, increased from an annual total of $182,000 to more than $700,000 each year, and under Hendee’s leadership, staff and faculty contributed more than $2 million back to the university. Collectively, the A Day for ASU campaign raised more than $8 million for the university. A provider panel, community resource fair and a workshop on policies and practices will highlight Come Out for Health Week at Georgia Regents University, March 24-28. The week’s activities are focused on health awareness for those who identify as lesbian, gay, bisexual, transgendered or those who may be questioning their sexuality. Events are being coordinated by GRU Equality, an independent alliance of GRU faculty, staff, and students bettering the campus experience for LGBTQ employees, students, patients, and visitors. Activities are co-sponsored by the GRU Office of Diversity and Inclusion, the College of Nursing, the Medical College of Georgia Office of Student and Multicultural Affairs, and the GRU Lambda Alliance. A Patient-Provider Panel and Community Resource Fair at noon, Monday, March 24 in Room 1103 of the Hamilton Wing of the Carl T. Sanders Research and Education Building. A lecture, “Diversity vs. Inclusion in Academia and In Practice, from Dr. Laura Hein, an Associate Professor in the College of Nursing at the University of South Carolina, at noon, Tuesday, March 25, in Room 1222 of the Health Sciences Building. Hein is a member of the Board of Directors of the Harriet Hancock LGBT Center and of the Gay and Lesbian Medical Association. Her research focuses on health disparities experienced by lesbian, gay, bisexual and transgender persons and the community. A Policies and Practices Workshop on Culturally Competent Care for LGBTQ Patients with representatives from the Atlanta-based Health Initiative, which works to improve the health and wellbeing of Georgia’s LGBTQ community through education, support, access to care, and advocacy. The workshop will begin at noon, Wednesday, March 26, in Room 1809 of the Children’s Hospital of Georgia. A training session for GRU the Safe Zone Program on Thursday, March 27, in the GRU Alumni Center. The Safe Zone Program is part of a national initiative to train faculty, staff, students and support services at colleges and universities in creating safe and inclusive environments for individuals of all sexual and gender identities. Pre-registration for the training session is required. A screening of the documentary “Transgender Tuesdays,” which tells the story of the Tom Waddell Health Center, the first low-cost public health clinic opened specifically for transgender clients. The movie starts at noon, Friday, March 28, in Room 1222 of the Health Sciences Building. For more information about Come Out for Health Week, visit the event page on Facebook, https://www.facebook.com/GRU.CO4H or call the MCG Office of Student and Multicultural Affairs, 706-721-2522. Thank you for demonstrating your commitment to Georgia Regents University and Health System through your daily efforts and your financial support. 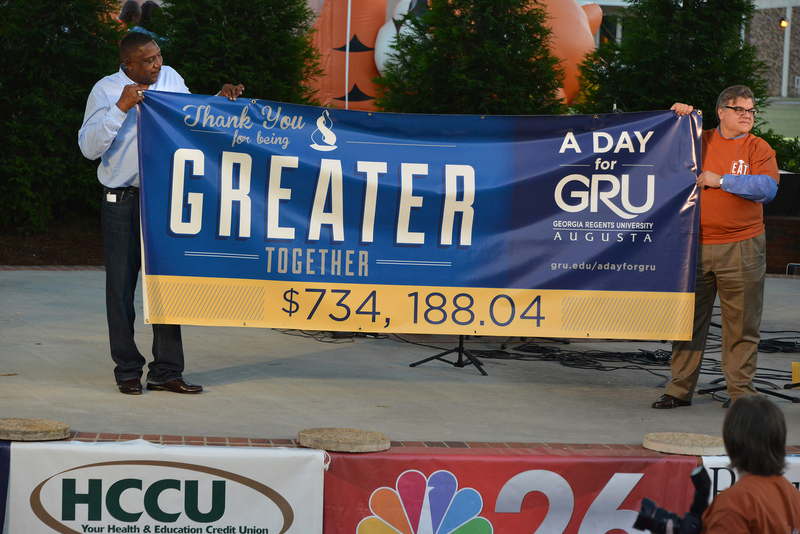 The 2013 A Day for GRU campaign raised $741,613.00 (and counting! ), and it’s all because of you – our faculty, staff, and community. 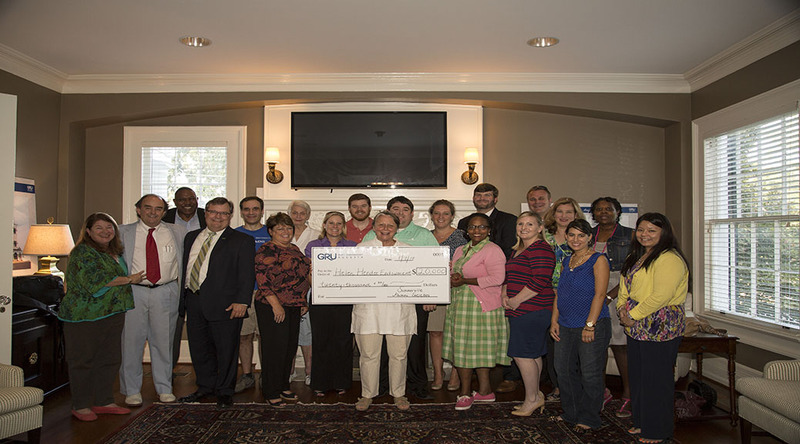 Our collective investment to the A Day for GRU campaign is a clear indication that we are inspired by, involved in, and invested in the good work of the Georgia Regents University enterprise. Your generosity sends a powerful message and is tangible proof that we believe in our organization’s mission so much that we choose to invest our own funds to ensure its success. 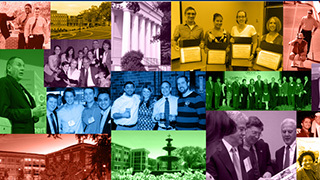 Whether you chose to direct your donation to support student scholarships, cutting-edge research, patient care, or some other area of great need, please know that your gift makes a real difference in our ability to advance our vision to be a top-tier university and health system that is a destination of choice for education, health care, discovery, creativity, and innovation. 2014 promises to be another exciting year for the Georgia Regents University community. Thank you again for your engagement – and for your investment in our future. 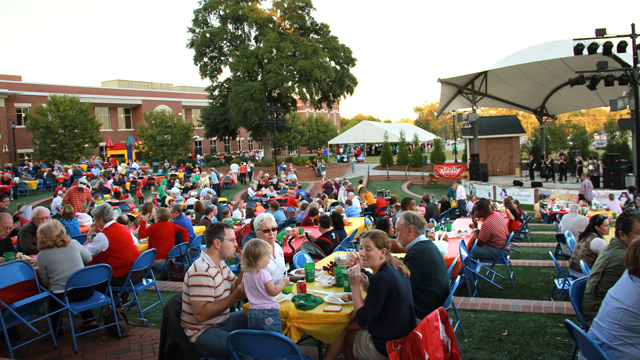 AUGUSTA, Ga. – The Alumni Barbecue and A Day for GRU Celebration is set for 5:30-9 p.m., Friday, Oct. 11 at the D. Douglas Barnard Jr. Amphitheatre on Georgia Regents University’s Summerville campus. Each year, more than 1,000 alumni, faculty, staff, students, and community supporters come to campus to enjoy food, fun, fireworks, and more. Proceeds from the annual event, which is sponsored by the university’s alumni association, have netted nearly $40,000 to support undergraduate scholarships since 2003. The barbecue will cap off of the A Day for GRU campaign, which raises money to support vital functions throughout the university and health system. This year’s barbecue will feature food from Sconyers Bar-B-Que, music by Mood Indigo, a kid’s zone with inflatables and games, and fireworks at dusk. Tickets are $10 for students, children and A Day donors (limit 2); $15 for adults; and $20 at the gate. For more information, or to purchase tickets, call the Office of Alumni Affairs at (706) 737-1759 or visit gru.edu/adayforgru. The A Day for Georgia Regents University campaign will culminate Friday, Oct. 11, at 5:30 p.m. in the D. Douglas Barnard Jr. Amphitheatre during the annual Alumni Barbecue and A Day for GRU Celebration presented by Georgia Bank and Trust. Faculty, staff, alumni, and friends will enjoy music by the Mood Indigo Band as well as barbecued pork and chicken with fixings by Sconyers. A Kids Zone will also be available for children’s entertainment. The official announcement of the campaign total and a fireworks show at dusk will highlight the evening. For tickets, visit giving.gru.edu/adaybbq or call the Alumni Office at 706-737-1759. Tickets purchased before the day of the barbecue will be discounted. Those who have already given to the campaign will receive a discount on tickets as well. The first 20 donors to make their gift of $25 or more via the A Day for GRU website today, Wednesday, Sept. 18, will receive a gift bag of Georgia Regents University giveaways! Those receiving gift bags will be notified via email at the end of the week. A Day for GRU is your opportunity, as part of the Georgia Regents University community, to show support for the work you do every day on behalf of our students, our patients, and our families. A Day for GRU gives every member of our GRU community the opportunity to further invest in a tangible way. And it’s through your efforts that we are improving lives every day. But the best is yet to come. Your support is more important than ever. Please make an investment in the future of Georgia Regents University. Visit gru.edu/adayforgru for a complete listing of events, to make your gift, and for additional information on the campaign. Good things become great things when the best minds come together. We are greater together! Don’t forget to also visit gru.edu/adayforgru to register for the Jaguar Jaunt 5k and fun run, purchase tickets for the A Day for GRU Celebration and Alumni Barbecue, and register for the parking spot raffle – all of these events benefit A Day for GRU! Tired of hunting for a spot? Here’s your chance to win a reserved parking spot for an entire year, and tickets are only $5! Purchase raffle tickets for the chance to win a premium parking spot of your choosing! Two spots are available: one on the Summerville Campus and one on the Health Sciences Campus. Both winners will be randomly selected at the close of the A Day for GRU campaign. Winners will be entitled to their spots for a twelve-month period (November 2013 – November 2014). Staff and faculty came out on Tuesday and Wednesday to give back to GRU and get a good meal in return in the kick-off event of the A Day for GRU fundraiser. On Tuesday, A Day for GRU kicked off on the Summerville Campus with the traditional hamburger lunch and a T-shirt in exchange for a donation. On Wednesday, the Health Sciences Campus got involved and had a breakfast and a lunch event at the Alumni Center. Staff and faculty on the Summerville Campus were excited about A Day for GRU and the potential for the new consolidated university. Kenny Reames, from the electrical department said he believed that it was fantastic that they had a chance to help the university take the next step. The sentiments were echoed on the Health Sciences Campus. For more information about A Day for GRU, visit gru.edu/adayforgru. Business After Hours, Sept. 26, Maxwell Alumni House, 5:30-7:30 p.m.
Jaguar Jaunt, Sept. 28, Maxwell Alumni House, 7:30 a.m.
ASUF Board of Trustees Meeting, Oct. 1, Augusta Country Club, 11 a.m.
Music Department Gala, Oct. 3, Maxwell Theatre, 6:30 p.m.
Russell Blanchard Lecture Series, Oct. 3, JSAC Ballroom, 6-7 p.m.
Health Fair, Oct. 8, JSAC Ballroom, 10 a.m.-2 p.m.
A Day for GRU Celebration and Alumni Association Barbecue, Oct. 11, D. Douglas Barnard Jr. Amphitheatre, 5:30-9 p.m.
“Greater Together” will be the theme for this year’s “A Day for GRU” campaign. The campaign officially kicks off on the Summerville Campus on Tuesday, Aug. 27, from noon to 2 p.m. with a lunch served in the Grove. The next day, Aug. 28, the Health Sciences Campus gets the first taste of A Day for GRU with a special breakfast event from 6 to 9 a.m. and a lunch from 11:30 a.m. to 2 p.m. at the Alumni Center for individuals who donate $25 or more. Some on the Health Sciences Campus may not be familiar with the Summerville Campus staple event, but overall, A Day for GRU is an employee and community campaign that brings everyone together with special events to raise funds for the school. All funds raised during the campaign remain within the university, and donors may also allocate funds to specific units, including athletics, a particular college, or the Children’s Hospital of Georgia. Non-restricted funds will be allocated to areas with the greatest need. Individuals who donate $25 or more, will have the opportunity to participate in the breakfast or lunch A Day for GRU First Day events and will receive a special token of appreciation. The meals at the Alumni Center will also feature a drive-through option for those who are unable to stay and eat. There will be numerous events throughout the campaign, culminating on Oct. 11 with the annual A Day Celebration and Alumni Association Barbecue to be held in the D. Douglas Barnard Jr. Amphitheatre on the Summerville Campus. A Day for GRU the First Day / Summerville Campus Kickoff, Aug. 27, Grove, noon-2 p.m.
A Day for GRU the First Day / Health Sciences Campus Kickoff, Aug. 28, Alumni Center, 6-9 a.m., 11:30 a.m.-2 p.m.